Me (to Husband): "I'm gonna take one of those Harry & David pears and slice it really thin. Then I'm gonna fry some bacon. Then I'm gonna toast some wheat bread with that Jarlsberg cheese dip on it and put it all together and make one hell of a sandwich. Would you like one, dear?" Husband: "Are you pregnant?" Something about Harry & David pears makes me think of strange and wonderful sandwiches. 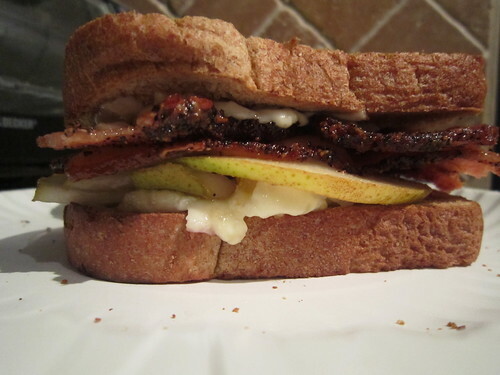 Last year... Pear & Brie Panini. This year... The Stork! Serve a World Series-inspired snack: Mix some dried cranberries int a bowl of Cracker Jack. Mix autumn trail mix: Toss dried cranberries with mini marshmallows and salted roasted cashews and peanuts. Try Cape Codders: Mix 1 cup vodka, 3 cups cranberry juice and the juice of 2 limes in a pitcher. Serve over ice. Serve a 5-min. appetizer: Mix dried cranberries into softened goat cheese and spread onto toasted baguette slices. Finish dinner with cranberry floats: Put pistachio ice cream in glasses and top with cranberry ginger ale. Beat the crowds and buy fresh cranberries. Sealed in a bag, they'll keep in the fridge for up to 2 months. Cosmos! Shake 2 oz. vodka and 1 oz. each of cranberry juice, lime juice and orange liquer with ice and strain. Freeze cranberry juice into ice cubes today; use them in a pitcher of water on Thanksgiving. Unwrap a brie wheel and top with cranberry jam. Wrap with foil and bake 15 min. at 350 degrees. Serve with crackers. Make Cranberry Shandies: Pour equal parts cranberry juice and beer into an ice-filled glass. Soak fresh cranberries in vodka in a large jar; cover and let sit 2 weeks. Strain and pour into bottles to give as gifts. Cranberries are good for dogs - so let them enjoy the leftovers. Mississippian Eric Miller and his father grilled pork loins and sold them during the holidays in his hometown of Anguilla. They couldn't get a good bottled barbecue sauce to baste the meat with after it cooked - so they just decided to make their own. Soon after, the "secret sauce" the Millers used on their pork loins were as sought after as the meat itself. Eventually, they started selling the sauce separately it was so requested. Thus Fit to Eat Sauce was begun. 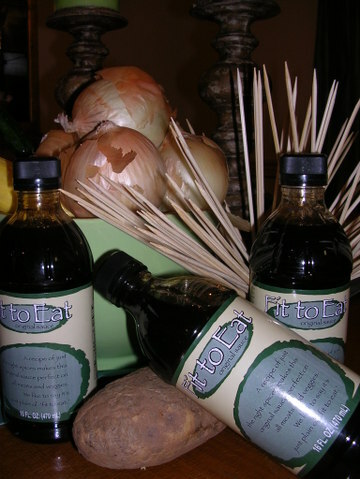 Reed's Food Technology in Pearl took the secret recipe and created a large batch of the sauce. Professionally bottled versions of the sauce (the original was distributed in mason jars) debuted in June.It's currently sold in 41 from Corinth to the Gulf Coast (including Persnickety in Madison, Interior Markets in Fondren, The Cupboard in Clinton, and Everyday Gourmet in Jackson). 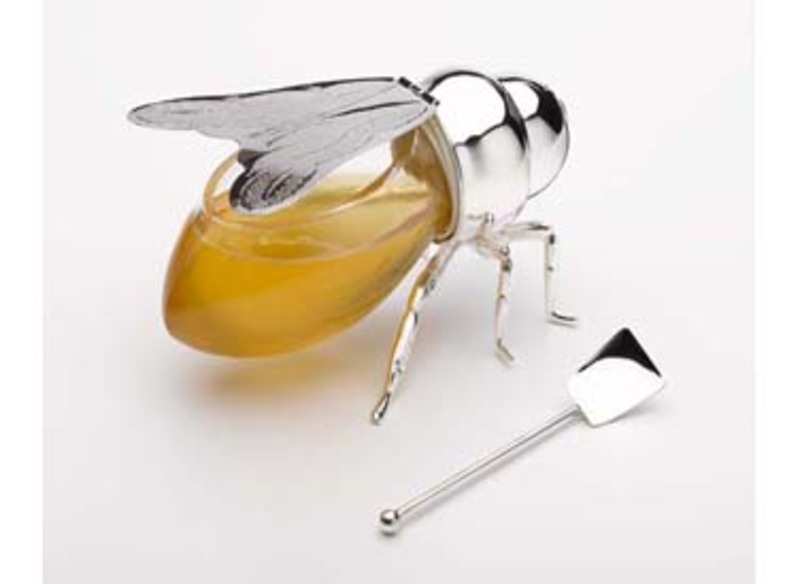 This cute little bee holds honey in a glass jar and comes with a silver-plated spoon for scooping. OK, I'm not quite sure how this differs from putting ice in your hot tea, but it looks damn nice anyways. And sometimes you just have to go with the aesthetics. Steep hot tea in the upper pitcher, then quick chill the beverage by pouring it into the ice-filled lower pitcher. 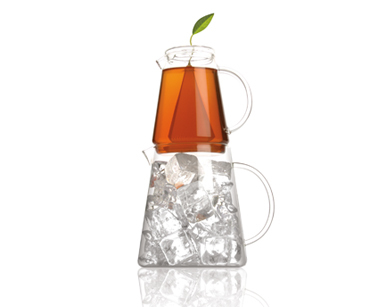 The hand blown stacking pitchers can be used with Tea Over Ice Pyramid Infusers or your own tea bags. In the June 2008 issue of Self magazine, Merritt Watts (in conjunction with Janis Jibrin, RD) tells us what we should order in the drive-through if we're on a diet. Today is Dippin' Dots 20th birthday. And, in observance, participating stores are offering a free cup of their new Birthday Cake flavor (made in honor of the birthday celebration) from 4 p.m. until close. The first beads of cryogenically frozen ice cream were invented by Dippin' Dots Founder Curt Jones in 1988. 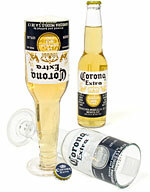 Now even when I decide I would rather have a glass of wine in the bathtub - rather than my usual Corona - I can still bring my Corona too with these beer bottle goblets. Heineken's 5-liter minikegs now have desktop delivery available. 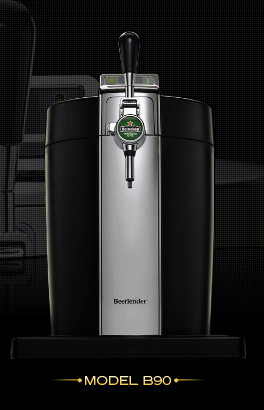 Krups made the BeerTender, a countertop Kegerator, specifically for Heineken's bantam barrels. It keeps the lager on tap at an ideal 38 degrees Fahrenheit and monitors how close you are to running out too.